The CHIMERA is made possible by DMM's choice of specialized 7010 alloy and hot forging process - that combined creates a strong I Beam design weighing in at only 30 grams (1.05 oz). Hot forging allows manufacture of more radical shapes and details - like the bump inside the bottom basket that serves to guide the rope towards the corner and away from the gate opening. 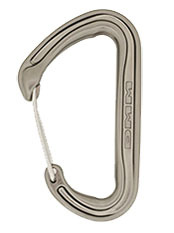 Bearing radiuses can also be similarly enlarged and made more rope and runner friendly. 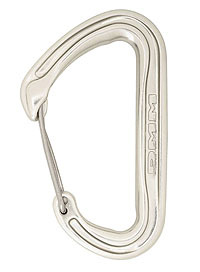 Sport, multi-pitch trad or super alpine climbers wanting to shed unnecessary weight will find CHIMERAS add a great boost to their climbing. 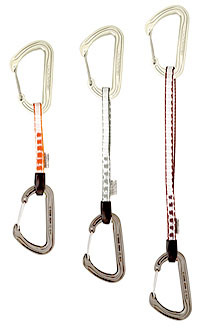 Available in 3 lengths with 8mm Dynatec Quickdraw Slings - to hold the anodized bottom biner steady while you make the clip and also prevent the carabiner from cross-loading when loaded. 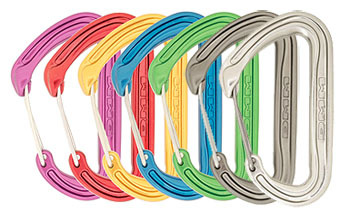 Color andodized adds smart looks and extra corrosion resistance.